The Republic of Ireland Schools select face a stern test against the Australian Schools select at Home Farm FC, Whitehall on Saturday, January 19 for an International Friendly scheduled to kick off at 1pm. This will be the eighth occasion these two teams have met in the last 19 years. The visitors have enjoyed the upper hand in proceedings thus far with an impressive record. Ireland have only won once, drew twice and lost four times in their previous outings against the southern hemisphere side. This will be an excellent challenge for the Head Coach William O’Connor (Balbriggan Community College) as he and his staff make their final preparations ahead of their Centenary Shield campaign. The Republic of Ireland’s title defence will commence on March 28 as the team travel to Somerset Park, home of Ayr United FC in their opening game of the SAFIB Centenary Shield series against the tartan army. The Republic of Ireland will then enjoy three games on the bounce during the Easter Break as they line out against England on April 12 in Dublin. O’Connor’s crew will then make the short journey to Belfast to take on neighbours Northern Ireland on April 18 in their penultimate clash of the season. The scholars will be hoping that they’re still on a solid footing for their final showing which will see them entertain Wales on April 25 in Dublin. The Republic of Ireland only joined the competition back in 2003 and tasted success immediately with an outstanding three in a row in the Shield (2003, 2004, 2005) but they had to wait until 2008 to recapture the silverware as England reigned supreme. The Republic of Ireland won again in 2010 and 2015. Their latest victory came twelve months ago when they defeated Scotland 3-1 in Home Farm FC to lift the prestigious trophy. The visitors will play a total of ten games in their two week tour of the UK & Ireland with the Republic of Ireland stop their fifth competitive encounter in this hectic schedule. The Australian lads kicked off their trip against England Independent Schools last Sunday and went down 3-2 to their hosts in a highly entertaining clash. The squad are also scheduled to play Bristol College, Welsh Colleges, Welsh Schools, Northern Ireland Schools, Scotland Schools, Fleetwood Town, England Schools and their tour will conclude against the English Colleges set up. The forthcoming fixture is a regular battle which always produces some excellent physical encounters. The last time the two sides met in January 2017, it was half-time substitute Hassan JALLOH (Arthur Phillip HS)who converted twice to ensure a 2-0 win. In 2015, they shared the spoils with a 1-1 draw. Ireland took the lead courtesy of Georgie Poynton (Coláiste na hInse, Bettystown), as he ran onto an excellent through ball from Conor Ellis (Colaiste Pobail, Bheanntrai) and raced through to slot the ball past the advancing keeper Sam Brown. Australia equalised on the hour mark. Matthew Millar got behind the home defence and as he shot, he was challenged by Dan Tobin (Oatlands College). The referee awarded a penalty for the challenge and Millar stepped up to stroke home from the penalty spot past the diving Corey Chambers (Gorey CS). The Irish side lost 2-3 to the visitors back in 2012 but enjoyed their only win to the Australian’s in 2010 when the Republic recorded a 3-1 victory. Again in 2008, it ended 1-1. 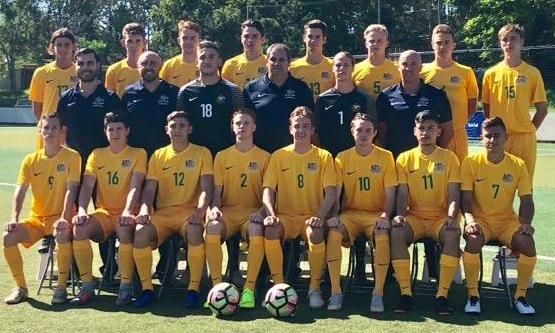 The Australian students have the bragging rights as they won narrowly in 2006 with a solitary goal and again in 2000 when they came out the other side of a seven goal thriller, earning themselves a 3-4 victory. William O’Connor has selected 18 players to face their Australian counterparts following an exhaustive trialing process since the Interprovincial tournament back in November. Carndonagh CS pupil Lee McLaughlin will miss out due to injury but he will be hoping that he recovers in time for some action in the series later this year. O’Connor will keep a watchful eye on the students as he attempts to finalise his squad for the season ahead. No doubt the players will relish the opportunity to represent their School and Country against a much fancied opposition.